Weddington Animal Hospital is pleased to offer acupuncture services for our patients. Acupuncture is an ancient therapy that has been practiced for over 3000 years and originated in China. Acupuncture involves the stimulation of pre-designated points on the body with small needles or pressure to restore balance of Qi, the body’s life force. Disease or sickness puts pressure on the entire body, which leads to imbalances and causes Qi to become weak or stagnant. Through stimulation of an acupuncture point, attention is brought to the body, leading to local dilation of blood vessels, stimulation of nerve endings, and release of synthetic opioids, leading to pain relief. Dr. Walker is a certified veterinary acupuncturist who received certification through the Chi Institute and even spent time in China during her training. She is proud to serve the community through acupuncture and is very passionate about integrative medicine. What Can Pet Acupuncture Help With? If your pet has a condition that is not listed above and you are interested in acupuncture, feel free to call or email our practice to speak with one of our doctors about acupuncture treatment options. How Does a Typical Appointment Work? Your pet is brought in for a 45 minute initial acupuncture consultation with our doctors, where a thorough history and physical examination will be performed. The doctor will review your pet’s records and ask you questions about their personality and daily activities. They will also examine your pet from head to toe, including looking at their tongue, feeling their pulses, and deciding on a treatment plan. Single, sterile use needles will be placed into acupuncture points on your pet’s body and left in for a pre-designated period of time. Occasionally, needles will be hooked up to a small electrical conduction unit to increase stimulation, or the doctor may choose to inject an acupuncture point with saline or B12. Most pets tolerate the needles very well and generally appear to enjoy acupuncture. Often, patients will fall asleep during their acupuncture treatment. For patients that are too sensitive to needles, alternative plans can be made for therapy. 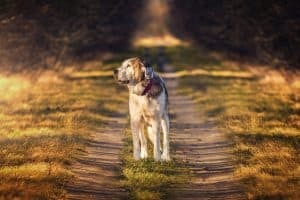 Each subsequent visit typically involves a discussion with our doctor on how treatment is going and a brief examination of the pet’s tongue and pulses. Occasionally, the doctor will scan certain points for sensitivity or pain to help guide placement of needles. You will be asked to remain with your pet while needles are placed. Needles typically remain in place for 5-20 minutes. How Often are Appointments Typically Required? Each treatment plan ultimately depends on the patient. Generally, it is recommended to start with once weekly or bi-weekly treatments to assess the patient’s response to treatment, progress and treatment success. When your pet begins to improve, longer periods between appointment may be made. Some patients are seen once monthly for “tune-ups”, some are seen every 6 months to a year. It may take several treatments to see results. Acupuncture effects typically appear to be cumulative, so treatments are initially recommended closer together to maximize post-treatment effects. Acupuncture is unfortunately not a single cure for most diseases. A multi-modal treatment approach is best for treating most conditions. Each condition responds differently to acupuncture. Some patients may see significant improvement after one treatment. Other times, it may take a few treatments, and some may see no improvement at all or for a very long time. We recommend starting with 4-5 treatments and assessing how your pet does after each treatment for small or large improvements. It may take time to see results and rarely, may not lead to improvement at all. 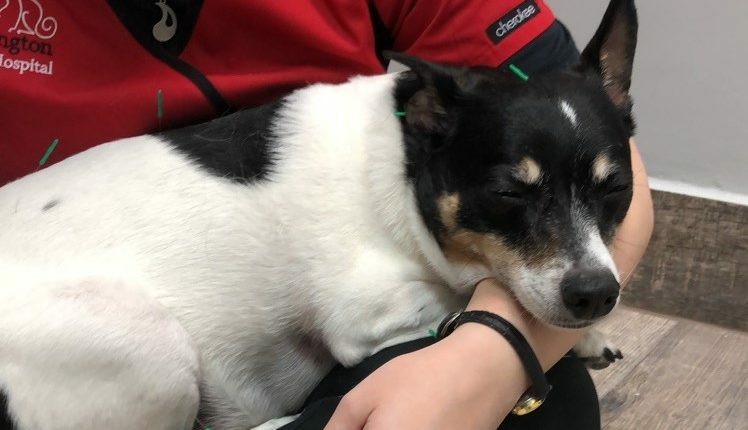 Dr. Xie, founder of veterinary acupuncture, states that it may take ~1/2 the time that the disease has been going on to see significant improvement. Weddington Animal Hospital is happy to offer acupuncture to all of the surrounding areas in our community. Our patients come from a variety of areas, including Matthews, Monroe, Ballantyne, Marvin, Waxhaw, Indian Trail, Waverly, Wesley Chapel and more! Acupuncture is a great integrative therapy and can be beneficial for a variety of medical conditions. Many of our patients who suffer from arthritis or other conditions see a great benefit in quality of life with acupuncture treatments. 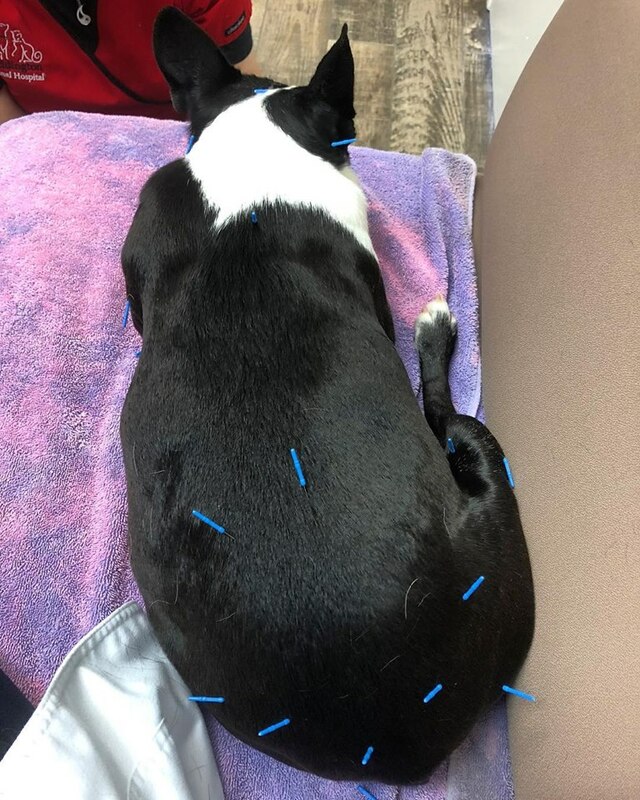 If you are interested in trying acupuncture for your pet, or have any questions for our veterinary acupuncturist, please feel free to call or email our practice.